As legend has it, when he was a young boy, Giacomo Agostini asked his father for permission to race on a bike. His father, who wanted his son to be a hard-working accountant, turned to the family's lawyer and asked for his advice. The lawyer confused motorcycling with cycling and encouraged him to go ahead with such a wholesome sporting aspirations. Agostini achieved an astonishing 122 Grand Prix victories and rightly so, the respect of every opponent he raced against. His first race was in 1961 in the popular Trento-Bondone climb, he rode a Morini 175 (bought on installments) and finished second. A few months later, the Morini factory contacted Agostini and following a practive race, he signed for the team. A year later he took his debut junior title and MV Agusta made him an offer he couldn't refuse. In the 1965 season Agisini and Mike Hailwood were team mates ,both riders competed in the 350cc and 500cc categories, Agostini finished runer-up in the 500cc but won the 350cc class. At the end of the season Hailwood moved from MV Agusta to Honda. In 1966, Hailwood was Agostini's main rival in the 500cc class, Ago succedded in beating his former team mate. From this point on, Agostini secured an astounding succession of World Championships in the 350cc and 500cc classes, see below. In 1973 tragedy struck Agostini when two of his friends and rivals, Pasolini and Saarinen, lost their lives in an accident at Monza, Phil Read also took his 500cc title. Ago left MV Agusta in 1974 for Yamaha in the 350 and 500cc classes, coming second to Phil Read in the 500cc category but winning the Daytona 200 at his first attempt. In 1975, Agostini took his revenge on Phil Read and won the 500cc championship. However, younger riders were begining to come through and he decided to return to MV Agusta as a privateer in 1976, alternating his appearance on track with a Suzuki 500. A year later he finished his career on a Yamaha. Following this, for two seasons he raced single-seater F2 and F-Aurora cars with little success. 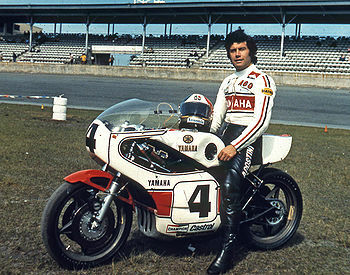 In 1982, Agostini made a return to the World Championship as manager of the Yamaha Marlboro team. Continuing his phenomenal success, the team secured three senior world titles with the American Eddie Lawson. Luca Cadalora and Alex Criville also rode for the team. Some years later, as manager of the Cagiva 500cc outfit, Agostini renewed contact with Lawson and worked with other talented riders such as Alex Barros, John Kocinsky and Doug Chandler. This page was last edited on 20 January 2011, at 22:49.